Yes, we have done 999 previously. Thanks Euan Williamson for the GIF. A selection of 10 links for you. Survived my personal Millennium Bug, but will the bugs? I’m @charlesarthur on Twitter. Observations and links welcome. “Unless we change our ways of producing food, insects as a whole will go down the path of extinction in a few decades,” they write. Intensive agriculture and pesticides mainly blamed. But climate change too. …The study suggested several explanations for the higher moral scores, including that developed moral reasoning could be supported by higher proficiency at morally disengaging with the subject, e.g. the ability to view the game as ‘just a game’. There was a pattern to these repeat stories though: they were almost all “junk” news, not the highly corrosive stuff that should have taken priority. We’d be asked to check if a story about a woman who was arrested for leaving her children in the car for hours while she ate at a buffet was true; meanwhile a flood of anti-semitic false George Soros stories never showed up on the list. I could never figure it out why, but perhaps it was a feature, not a bug. And here we are today, with Snopes and the Associated Press pulling out of their partnerships within days of each other. It doesn’t surprise me to see this falling apart, because it was never a sufficient solution to a crisis that still poses a real threat to our world. The contrast between how newspaper journalists experienced the supposed panic, and what they reported, could be stark. 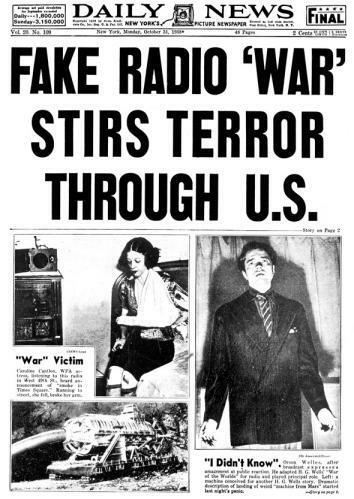 In 1954, Ben Gross, the New York Daily News’ radio editor, published a memoir in which he recalled the streets of Manhattan being deserted as his taxi sped to CBS headquarters just as War of the Worlds was ending. Yet that observation failed to stop the Daily News from splashing the panic story across a legendary cover a few hours later. …in preparation for the week, I export all my contacts from Google, which amounts to a shocking 8,000 people. I have also whittled down the over 1,500 contacts in my iPhone to 143 people for my Nokia, or the number of people I actually talk to on a regular basis, which is incredibly close to Dunbar’s number. A light switch can stick around for decades, as with the doorhandle. When you touch the switch, you are subconsciously sensing the presence of others who have done so before you, and all those yet to do so. You are also directly touching infrastructure, the network of cables twisting out from our houses, from the writhing wires under our fingertips to the thicker fibres of cables, like limbs wrapped around each other, out into the countryside, into the National Grid. The light switch when jetlagged is vorhanden — suddenly present-at-hand, “oppressively obvious” —where usually its everyday resilience means it is zuhanden, simply ready-at-hand, normalised, routine. When “stumbling around”, he notes that we don’t pay attention to the object itself — here, the irreducible thing that is the light switch —and so nor do we stand any chance of paying attention to the broader systems of living, of infrastructure, that it is connected to, and part of – and, for Morton, our understanding of mass extinction due to climate change. Bet you didn’t expect to arrive there when you started that extract. Whittaker has been on a tear with these stories. When health journalist Christie Aschwanden was traveling the world as a competitive ski racer in the 1990s and 2000s, recovery between training sessions basically meant doing nothing — taking a day to sleep in or lie around with a good book. About a decade ago, she noticed something had changed: recovery became a thing athletes actively performed — with foam rollers, cryotherapy, or cupping — as part of their training routines. These recovery tools were heavily marketed to athletes, including amateur ones, as a means to boost performance and bust muscle aches. In a new book, Good to Go: What the Athlete in All of Us Can Learn from the Strange Science of Recovery, Aschwanden walks through all the biggest recovery fads of the past decade — and exposes the shoddy science backing most of them. It’s an intelligent and entertaining tour of fitness research for anyone who exercises, with clear advice on what actually works to aid recovery. I won’t give away all the juicy details in the book, but I did ask Aschwanden to walk me through three of the most dubious recovery methods she uncovered. Here’s what she told me. Hydration overhyped, cold post-exercise bad, cupping nonsense. Relaxing baths good. A number of Android phones, and Apple in its betas, are showing “5GE” in the menu bar for AT+T on this. I’ve seen suggestions on Twitter that Apple doesn’t have a choice in what it displays; that it comes in the form of an image file from the network. Good for Sprint suing, though – which was the obvious move: none of the handset manufacturers is going to. Totally not in their interest. re. Audiophile switch: you need *something* to connect your $1,000 audiophile ethernet cables to ( https://arstechnica.com/staff/2015/02/to-the-audiophile-this-10000-ethernet-cable-apparently-makes-sense/ , https://arstechnica.com/gadgets/2015/07/340-audiophile-ethernet-cable-gets-a-marginal-pass-on-the-test-bench/ ). IIRC, those cable have a “to source; to dest” orientatiion too, you don’t want your acks to travel faster than your data ! On the other hand, the $200 Apple Airport Extreme wasn’t much different from a $25 Mi Router ( gearbestreview.blogspot.com/2016/06/couponxiaomi-mi-wifi-router-3-only-2499.html ) and nobody ever got that bothered about the Airport’s price. Both are instances of throwing money at fake problems. You avoid lemons (there are plenty of bad cables and routers) and you get better defaults docs and support. But you’re buying a bit of a dream: both the airport and the cables weren’t that good and the alternative of replacing stuff that fails is still way cheaper. Or you can get Really Good Stuff without the brand/label for the same price (ie. a “gaming” router with top-end QoS) , but it requires a bit of work to set up correctly. Some stuff is just Veblen. re. Young people and morality. It”d be interesting if they did the same thing about empathy. I’m curious about the relationship between both, and societal impact. IIRC, there’s also a strong correlation between both legal and illegal psychoactive drugs and empathy, I’m curious if that could contribute to an explanation of voting in the US. I’ve long argued that Google in particular can play the FOSS game because even if competitors piggyback on Google’s efforts (fork Android, fork Chrome, fork ChromeOS… ), they’ll never monetize half as well – make that 1/10th as well, so won’t be able to fund competitive proprietary add-ons/services (gDocs, Maps, …). And the situation is even worse for non-piggybacking competitors w/ higher costs (Firefox, HERE ! Maps…). I’m curious if the EU, which seems to lead in structural anti-monopoly efforts, will find a way to open up monetizing that doesn’t scupper innovation. I can’t think of one myself, because tracking and profiling are such a big part of monetization, and that’s ad platform-specific, and I’d rather it stayed that way. re the “doing w/o GAFA” series, it’s enlightening as a regular-Jane experience (conclusion: undoable), but probably too apocalyptic thanks to low expertise and zero compromise. An attempt designed by an expert to be rolled out by/to end users would be a lot easier, more functional, and more sane. On the Google side, a more realistic and practical approach would probably be to use LineageOS, download non-Google apps from apkmirror (especially Firefox with addons, HERE ! Maps and a mail client), use Framasoft’s office suite, and use a VPN. Fun tidbit: pretty much all Androids with an audio jack (wired headset needed as an antenna) have FM radio too, heh ? I use that quasi-daily. It’ll be interesting to see how Apple handles this (or at all, if the outcry doesn’t reach “must handle” proportions). For Google, the issue isn’t as sharp because sideloading. For Apple, an appstore ban means an utter ban, and presumably lost sales.